The juvenile justice system, much like the criminal justice system, has a high number of youth with behavioral health issues. The National Center for Mental Health and Juvenile Justice reports that approximately 2/3, or 70%, of youth in the care of the juvenile justice system have a diagnosable mental health disorder and 60% meet criteria for a substance use disorder. Additionally, 30% of these disorders are so severe that they lead to functional impairments. This course will provide professionals working in juvenile detention and community confinement facilities and in community-based supervision capacities with a brief overview of behavioral health disorders (which includes mental health and substance use disorders) and potential causes. 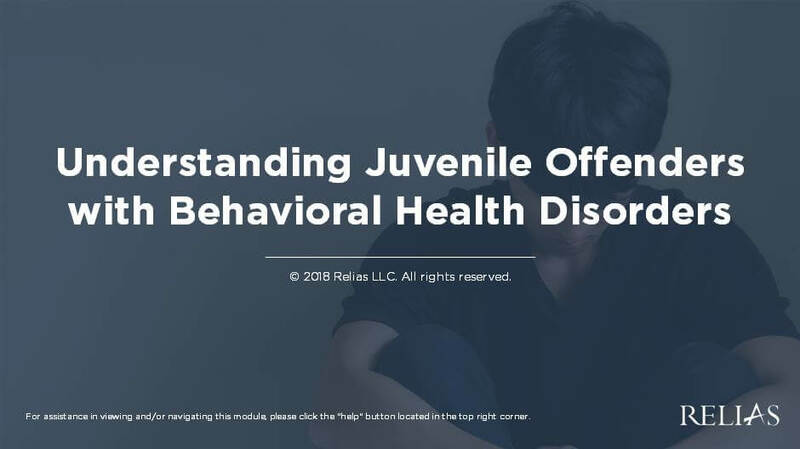 Additionally, information will be presented on common types and symptoms of behavioral health disorders experienced by youth involved in the juvenile justice system. Finally, you will learn about the difference between screening and assessing for behavioral health disorders. DSM™ and DSM-5™ are registered trademarks of the American Psychiatric Association. The American Psychiatric Association is not affiliated with nor endorses this course. The Diagnostic and Statistical Manual of Mental Health Disorders, commonly known as the DSM-5™ (for the current edition) is used to diagnose whether an individual has a behavioral disorder. The manual emphasizes that making such diagnoses requires specialized training. In a juvenile justice setting, only mental health professionals should decide whether a juvenile has a behavioral health disorder. Define and describe what causes behavioral health disorders. Identify 3 reasons juveniles with behavioral health disorders are involved in the justice system. Explain 3 differences between screening and assessment for behavioral health disorders. Identify up to 8 common groups of behavioral health disorders and list at least 3 common symptoms of each. A. What Causes Behavioral Health Disorders? The target audience for this course is: Correctional Officers; in the following settings: Juvenile Corrections.